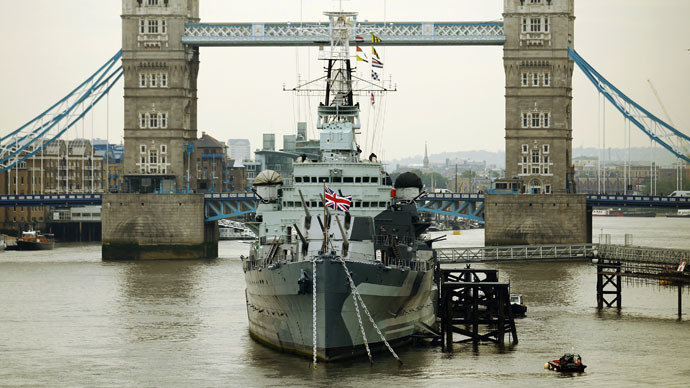 Hackers are fighting to prevent a doomsday scenario aboard a decommissioned warship on the River Thames, under the watchful gaze of arms companies and spy agencies. The Cyber Security Challenge Master Class is the final event of a year-long series, the culmination of regional events to whittle the number of applicants down to an elite few. The surviving 42 tech-heads are now aboard the decommissioned WWII battleship HMS Belfast, which is moored on the Thames, taking part in a scenario designed by some of the scheme’s sponsors. Their aim? To stop a naval gun battery hijacked by tech-savvy terrorists from blowing up London’s City Hall – and presumably Mayor Boris Johnson inside. While the eventual winners are not guaranteed a job, the sponsors of the challenge read like a who’s who of the UK intelligence and defense industries. Surveillance organization GCHQ, the Cabinet Office and the National Crime Agency (NCA) –Britain’s version of the FBI – are just some of the government agencies involved. The Ministry of Defence (MoD) and its US equivalent the US Department of Defense (DoD) will be sponsoring the event, as will Central Volunteer Headquarters (CVHQ), a secretive military reserve unit drawn from across the armed forces and charged with cyber security. Private defense companies like Northrop Grumman, Lockheed Martin, Raytheon, Airbus and Qiniteq have also thrown their weight behind the event. The patron of Cyber Security Challenge UK, said “Cyberspace is woven into the fabric of our society; it is integral to our economy, our communities and our security. “Defending all of our interests in cyberspace is a relatively small cadre of talented and highly-skilled public sector and private sector cyber security professionals. This pool of professionals must grow and the Cyber Security Challenge UK offers an innovative and exciting way of attracting talented individuals to take up rewarding careers in this field,” Baroness Neville-Jones said. While Boris Johnson last year volunteered to be shot at by a water cannon to prove that the use of such a device was safe, the mayor’s office is yet to publicly define his position on naval gunfire. The winners will be announced on Friday evening.